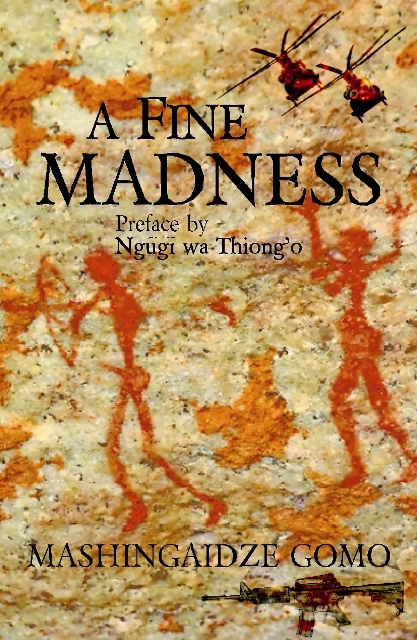 Part prose, part poetry, A Fine Madness is a befitting title to this evocative offering about war from Mashingaidze Gomo. A forward written by Ngugi wa Thiongo, sets the scene for what’s to come; a narrative that tells the story of war in the Congo through the verbatim account by a soldier who lived through it. Important to state that Gomo, who is Zimbabwean was an air force pilot, who served in some of Africa most devastating wars, including the war in the DRC, known as ‘Africa’s world war.’ Gomo’s experiences on the battlefield have served him well because he skilfully paints a visual tapestry of heinous images, stringed together by the words of an observant soldier through whom, we experience the loneliness, horror and harrowing nature of war. As conflict rages in Libya, Ivory Coast and who can forget the DRC, where militias continue the fight for their share of the nation’s minerals, A Fine Madness is a poignant reminder about the devastating effects of war on the mind and the destruction it leaves in its path. Gomo reminds us about the human cost of war. This is a deep excavation of Africa’s wars and how they have in turn turned her children into beggars though they have all they need, which has resulted in a painful existence. A Fine madness is Gomo’s song for Africa and Africans. This entry was posted on Monday, April 11th, 2011 at 2:31 am	and is filed under Africa, Book Reviews, Journalism. You can follow any responses to this entry through the RSS 2.0 feed. You can leave a response, or trackback from your own site. Belinda, just learning of this book. Is it as ‘packed’ as they say? Looking forward to reading it. Regards. well l love the novel as a student l find it interesting however wld want to know the significance of the geological setting. great imagery throughout….really loved the book.hope its not Mr Mashingaidze’s last. The strength of the book is found in Gomo’s ability to observe and contemplate the cancerous chaos in Congo as the 1999 civil war spreads on like veld fire. Through the effective use of imagery the author in chapters such as”Tinyarei” and “Show me a honourable destitute” walks the reader through the face of the battlefied as well as the life of the people in Congo heads on to the ranging war thus highlighting the destruction of property, undevelopment ,loss of life and the demise of moral beacons as prostitution seems to have become an option because of destitution.Not all is negative in Gomo’s presentation of war,indeed the author shows the beauty of war with regards that the war being fought in Congo is a war by african armies to defend the sovereignty of Africa from neo-colonical imperialism of europe which is sponsering rebel groups amongst the african people.